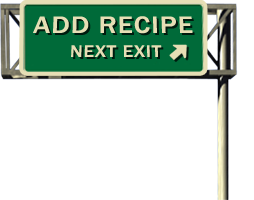 I found this recipe on a bottle of hot wing sauce, it's a great dip for an easy lunch, the guys watching the ball game or sharing a snack between new RV friends we just met at the campground. It's also a good way to use up those leftovers from the grocery store chicken you picked up for dinner the night before although canned chicken works too. This is big flavor social food without the sticky fingers covered in hot wing sauce. For me this dish goes everywhere hot wings could go. If you like hot wings dipped in creamy blue cheese or thick ranch dressing, you will love this dip. 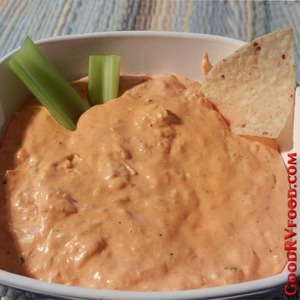 In a saucepan mix chicken, cream cheese, hot wing sauce, dressing and cheddar cheese. Heat stirring occasionally until the cheese is fully melted and creamy. Taste for spice and add more hot wing sauce if you like it more spicy. Serve hot with chips, crackers or veggie sticks. I like traditional hot wing sides like celery stalks and carrot sticks. This dip gets thicker when it cools which is not much of a problem when sharing between four or more friends because it goes fast. It keeps warm longer in crock pot or in a fondue pot over a low heat source.